Earlier this week, Tilray Inc., which is a small company based out of Nanaimo, BC, Canada, saw its market capitalization hit roughly $25 billion USD. Investors and traders are currently caught up in the marijuana craze right now, which has been affectionately called the "Dot Bong Boom". 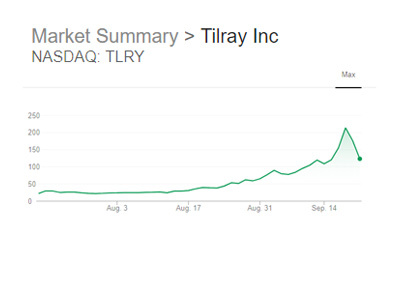 Tilray Inc., with its low float, has been one of the biggest beneficiaries of the craze, as its shares have soared into the stratosphere. With company insiders unable to start selling their shares until early 2019, Tilray Inc. has seen its shares hit as high as $300 due to a small float. Short sellers who jumped into the stock early in the move were absolutely demolished, and those who tried to jump in later were likely unable to find shares to short. This meant that many people moved to the options market, which resulted in massive volatility (implied volatility soared well north of 300% on Wednesday) and incredibly high premiums. For instance - shares of Tilray closed at $123 on Friday afternoon. If you wanted to buy a $125 put that expires next month, you would be looking to pay out something like $37 in total premium. Even call premiums, which were relatively "cheap" (compared to the puts) heading into last week, have soared in cost as well. Helping to push shares of Tilray higher is the fact that Privateer Holdings Inc. holds 75% of the company. Privateer Holdings Inc. is backed by investor Peter Thiel, who was one of the first investors in Facebook, as well as numerous other companies. This helped to give Tilray, which posted just $20 million in revenues last year, some legitimacy in the eyes of investors. As mentioned, the relatively small float was gasoline on the fire, sending shares of the company up as much as 200% last week. Add to that the frequent media mentions and overwhelming attention on social media and you had the ingredients for a move that reminded people of 1999. Where does Tilray Inc. go from here? Well, there are numerous positive catalysts on the horizon, including legalization in Canada (October 17th). In addition, numerous larger companies are eyeing the marijuana sector in general, with Coca-Cola and Diageo both reportedly looking for companies to invest/partner with. In short - the party may not be over yet in the marijuana sector. In fact, we may be a long way from the party coming to an end.